Note: this report covers PSI's response to the Haiti Earthquake, which accounts for a small portion of PSI's overall activities (about &dollar;200 thousand out of &dollar;400 million). For more on the full scope of PSI's activities, see our full report on PSI. Google searches: PSI evaluation, PSI Haiti reports. We did not find a breakdown of PSI's expenses in Haiti. GiveWell has an extensive report on PSI's work (both evaluation and activities).9 PSI provides a high level of detail on its worldwide activities and use of funds. Chronicle of Philanthropy. A Roundup of Haiti Fund Raising as of January 29. http://philanthropy.com/article/A-Roundup-of-Haiti-Fund/63823/ (accessed January 10 2011). Archived by WebCite® at http://www.webcitation.org/5vdivBRpJ. PSI. Annual Report (2010) (PDF). PSI. Annual reports. 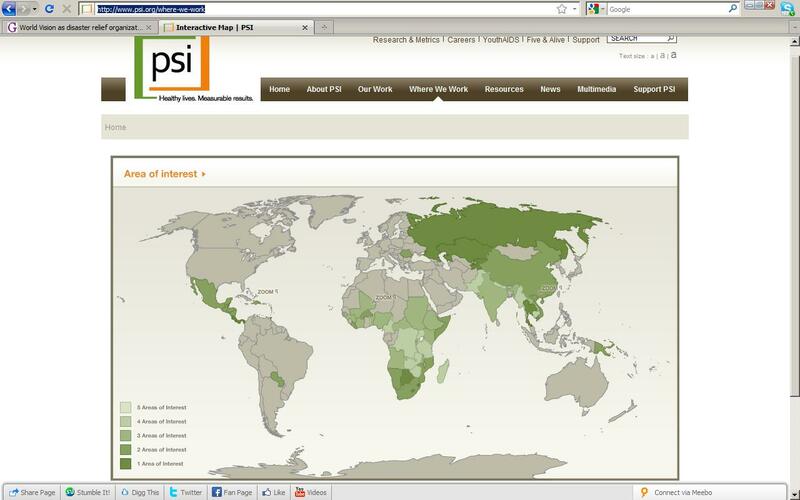 http://www.psi.org/about-psi/annual-reports (accessed January 10 2011). Archived by WebCite® at http://www.webcitation.org/5vdiiguWY. PSI. Country Leadership. http://www.psi.org/about-psi/country-managers (accessed January 3, 2011). Archived by WebCite® at http://www.webcitation.org/5vSi1naLp. PSI. Haiti. http://www.psi.org/haiti (accessed January 3, 2011). Archived by WebCite® at http://www.webcitation.org/5vSgp30cY. PSI. Home page. http://www.psi.org/ (accessed January 10 2011). Archived by WebCite® at http://www.webcitation.org/5vdiJ2sr8. PSI. Interactive map (JPEG). http://www.psi.org/where-we-work?phpMyAdmin=D673WcPmz30VmXaIcHmZXgbNRE3 (accessed January 11, 2011). Archived by WebCite® at http://www.webcitation.org/5vSgmq0Yk. PSI. Press releases. http://www.psi.org/news/press-releases (accessed January 10 2011). Archived by WebCite® at http://www.webcitation.org/5vdidP7Wp. PSI. Progress report. http://www.world-psi.org/TemplateEn.cfm?Template=/ContentManagement/Cont... (accessed January 3, 2011). Archived by WebCite® at http://www.webcitation.org/5vSgrGmmQ. PSI. PSI responds to the cholera outbreak in Haiti. http://www.psi.org/psis-response-cholera-outbreak-haiti (accessed January 10, 2011). Archived by WebCite® at http://www.webcitation.org/5vdjMsCpn. PSI. Where we work. http://www.psi.org/where-we-work (accessed January 10 2011). Archived by WebCite® at http://www.webcitation.org/5vdiaDYyw. 5. Chronicle of Philanthropy, "Haiti Earthquake Fund raising, One Year Later." “From February to March 2010, PSI reached an estimated 65,000 people living in displacement camps and settlements with messages about safe water, hygiene, sanitation, HIV and prevention of sexually transmitted infections, and family planning through interpersonal outreach, mobile film projections and sound truck events. PSI/Haiti is also playing a coordinating role in the Vector-Borne diseases Working Group for net distribution.” PSI, “Annual Report (2010),” Pg 11.